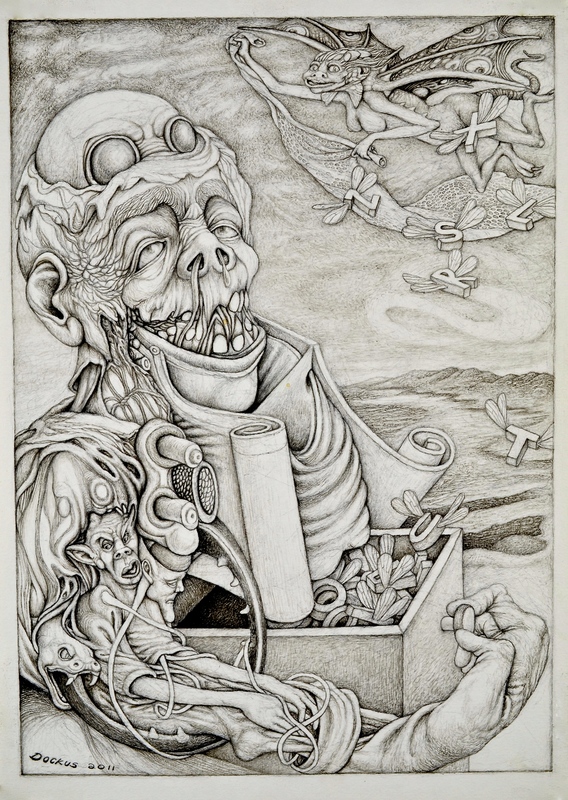 This entry was posted in art, graphite & ink and tagged downfall, human ideal, outsider art. Bookmark the permalink. Thank you for your kind praise and interesting observations. Your feelings towards poetry seem rather to vindicate Tzara, the progenitor of Dada, whose prose is more electrifying than even Torma’s: ‘those who shout loudest against [poetry] are actually preparing a comfortable perfection for it’. I daresay you might enjoy Tzara’s works. As for your own, I find that your proficiency with both words and pictures — and in a way your subject matter — is more than a little Blakean. Your visual work, otherworldly and richly symbolic, has a really menacing quality about it. But it is from your expository prose that I derive greater enjoyment. It is relentless and beautiful and almost Lawrentian at times. I look forward to more. The intelligence of your comment, the care and precision you display in your choice of words, in all your words it appears, is heartening and encouraging, even more so to me because I recognize your own writing does not come without intense thought and effort. Believe me, I understand intimately the personal cost. Sometimes I circle like a hawk over my own work. With sincere appreciation and, if you’re not too proud to take it because you are after all The Colossus, with some return sympathy, I thank you. This one got me talking. Your explorations seem aimed at the inner workings of our beings – literally, the mechanisms inside us that create outward appearances and functions. Uncontrollable emanations squeeze out of our bodies, if not fully, enough to tweak our beings via puppetry – the emerging alien, the gremlin in the forearm. I also see it in “Sun Egg…” and “Alienated Mind”. Even “Horror Vacui” appears a mess of guts on the wrong side of the stomach. Art reflects reality, as biology, delving ever more microscopically into our selves, finds bacterial partners in our evolution, selecting, switching on, modifying. Even those bacterial beings have bacteria within them, to evolve them suitable to our needs. We are, as in your drawing, a mass of creepy-crawlies pulling levers, pushing buttons inside us. We would not exist without them. There is nothing horrible about that, is there? I am reminded of the Aztec and Maya effigies of gods sprouting serpents, freed by severed heads. A horror to those new to the continent, but a source of comfort to the people who created them – an affirmation that all is as it should be. I assume you find comfort in your creating process. Acquisition of understanding? Knowledge? Catharsis? I do enjoy the drawings, but I can’t let them sit and glow. I am prone to look for meaning, to mentally tidy them up. Brilliantly interpreted, Tailess Monkey. I’m proud to have your words posted here which not only vividly speak for themselves, being zesty and invigorating, but they also compliment and even clarify my work. I really appreciate it. Your words are a pleasure to read in their own right. We share in common the desire to glimpse behind obvious appearances at the inner mechanisms which generate them, not satisfied to let pictures vainly bask in their own glow, showing off like peacocks. A mirage in the desert, being only an illusion, could never really satisfy thirst. My own images develop out of an inner drive and necessity. I can’t create just any image. I don’t intend them to turn out grotesque or to have about them ugliness, weirdness, or whatever may cross one’s mind upon first viewing. I think you’re onto something in your reference to Aztec and Maya effigies and the function and affirmative meaning they had for those who made them. If one looks beyond appearances, primal energy is their motor, the “what is” being what has been rendered visible in symbols. I couldn’t adequately explain all that goes into the making of my own images, and what exactly I carry away from the creative process. I don’t feel it’s exactly knowledge, but more like a loss of knowledge, a shedding of old skin, and an opening of possibility. I don’t always feel good and a sense of release from art. Often I feel fresh and young again but as vulnerable and anxious as a child. Most of the time, however, after shedding an old skin I crawl out and find that I’ve remained a twisting and winding belly-crawler. About artists the term “divine frustration” has been used, which may be more common than catharsis or the release similar to flying. Demons still inhabit me, and by what I do, they end up making themselves more at home, not less, and so do the creepy crawlies. I can’t honestly say I’m comfortable with this situation, but as you do, I still see all entities, from microcosm to macrocosm, as animated parts of a larger dynamic system, if a system it could be called, and each has its place and function, including nonsensical and absurd beings. The creature “Odradek” which Franz Kafka described in his short story “The Cares of a Family Man” is utterly fascinating to me.